Turn a URL into a base64 encoded jpg, png, bmp or pdf. You can use the get data from external api to “check status” for either status ok or “step_percent” upto 100. I will add the direct file convert function in the coming days too. could be handy if you want all user profile pics to be in the same format among other things. Sounds great. Looking forward to trying it out! But how does this work? I mean what do you put inside the fields? Ok, first you want to "convert URL to image. 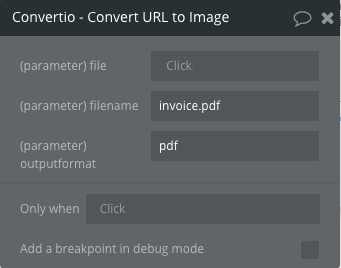 File = the url you want to convert - by the looks that will be your internal invoice page. now run the workflow, that is a request to convert the url. 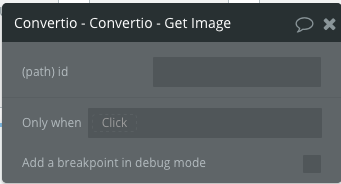 after a few seconds you can then allow either a create data action to save the id that is returned or set the state of something with the id with the intention of having it put into the field of ID for the get image action. the image will show you what I mean although you cant do it like that as the file would not have generated before it try’s to get it. I´m getting this error all the time. I´ve configured like the image below. 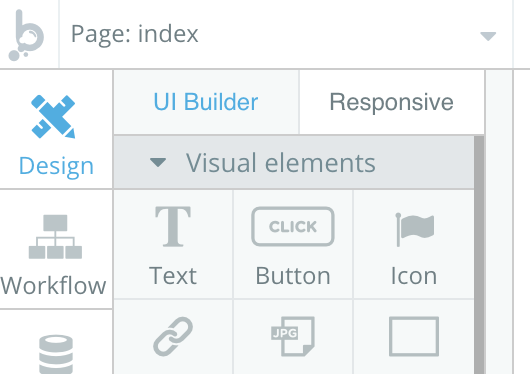 One thing I forgot to ask is if this downloads a PDF of the URL page or what does it do? Hehe, sorry I should have asked before. you may find it better to have the "content of the action get image create a database entry then call it up with a button to that there is more of a delay. Wow, this is getting a bit complicated but thanks for your help. Would you mind creating an example in the bubble forum so we can see it working? I will do it make one up now, give me a minute. Thanks @jarrad I appreciate it. Thanks for this, Jarrad! One question–I assume the URL has to be public for Convertio to reach it, which presents a problem if running an app on https and/or including data privacy rules to prevent anonymous users from, for example, accessing the invoice pages for your user’s company. Is there a way around this? Or is it is simple as the fact that you’ve granted access to Convertio via an API key enough to ensure their server can hit the page? I see what your getting at, I just tested something then. all you would need to do is hide the major group that the whole invoice sits in and set when getdatafrompageurl’s code is <your_code> its visable. meaning its a blank page when ever someone would try to land on it. you also have the option of programming a kind of on switch as you start the workflow starts to create the convert request and off swith when its finished getting the pdf. the other thing you could do it create a new temp-invoice on the way through making that page have that invoice avail. then deleting it after the get converted pdf runs. personally I would just make a stupid long parameter ie. and have a workflow change the code and the objects effected by the code every so often. I tried opening the bubble editor and its redirecting me to bubble homepage. Can you please repaste the link? @jarrad great plug-in works flawlessly. 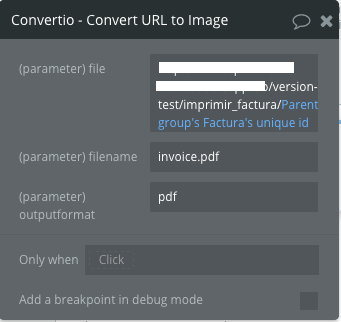 In addition to converting a URL to the three graphic formats or a PDF… Are the other formats (available on Convertio website) accessible through the API? I tried with no luck. Sorry I forgot to mention editor earlier. 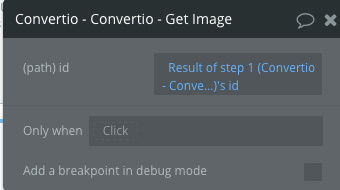 Convertio seems a bit complex to understand but thanks to your demo app, we can figure this out on our own.